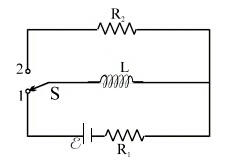 In the circuit shown, initially the switch is in position 1 for a long time. Then the switch is shifted to position 2 for a long time. Find the total heat produced in R$_2$. In position 2 the current is initially $I_0=E/R_1$ but it does not remain at this value, it decays exponentially. How long it takes to decay depends on the energy stored in the inductor. The initial *power* generated in $R_2$ is $I_0^2 R_2$ Watts - *not* $I_0 R_2^2$. But you are asked for the total *heat energy* dissipated in $R_2$ in Joules.